^ Ridley, H.N. 1909. Nepenthaceæ. [p. 59] In: The flora of the Telôm and Batang Padang valleys. Journal of the Federated Malay States Museums 4(1): 1–98. ^ 4.0 4.1 Clarke, C. & C.C. Lee 2012. 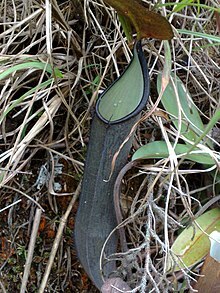 A revision of Nepenthes (Nepenthaceae) from Gunung Tahan, Peninsular Malaysia. 互联网档案馆的存檔，存档日期2013-10-07. Gardens' Bulletin Singapore 64(1): 33–49. ^ 5.0 5.1 夏洛特. 食蟲植物觀賞&栽培圖鑑. 台北: 商周出版. 2007: 64–65. ISBN 978-986-124-850-9. ^ 8.0 8.1 Clarke, C.M. 2001. Nepenthes of Sumatra and Peninsular Malaysia. Natural History Publications (Borneo), Kota Kinabalu. Bourke, G. 2003. Exploring the Genting Highlands.PDF Carniflora Australis (2): 23–26. Nepenthes ramispina. IUCN Red List of Threatened Species 2006. International Union for Conservation of Nature. 2000. Listed as Vulnerable (VU D2 v2.3). Shivas, R.G. 1983. Nepenthes of Gunung Ulu Kali.PDF (1.54 MiB) Carnivorous Plant Newsletter 12(3): 65–67.